DAC’s expert and enthusiastic guides – all trained in architecture and design fields – provide a local perspective on this city known for livability and innovative buildings. Our guides’ deep knowledge and storytelling skills give your group a glimpse into Denmark’s rich design culture. As a non-profit organization, DAC is Denmark’s forum for architecture, design, and urban culture. It’s our mission to share architecture – and start a dialogue about what makes a livable and lovable city – with visitors like you! All walking, bike, and boat group tours include admission to DAC’s permanent and rotating exhibitions on architecture, design, and urban planning. Flexible tour departure times and dates to meet your group’s unique needs. Tour available by foot, bicycle, and boat, in neighborhoods throughout the city. Tours expertly led by passionate and enthusiastic guides – fluent in English, most are masters’ level students in architecture or design fields. DAC is recognized as a leader among architecture centers across the globe. Choose your private group tour. Request a reservation. Share a few details about your group with us and we’ll follow up with you soon. Need more information on bringing your group to DAC? We have answers! Contact our Tour Booking department. tourbooking@dac.dk. Or give us a call Monday – Friday between 10:00am – 12:00pm (GMT +1) at +45 2096 9342. Visiting by yourself or with a friend? Explore our year-round public tours. Let DAC’s expert tour planners create a customized experience for your group – in almost any Copenhagen neighborhood. 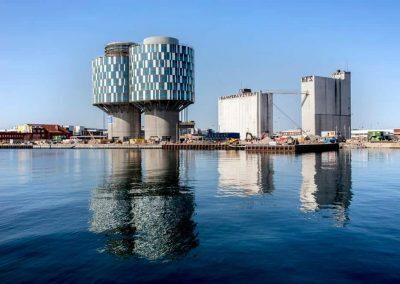 We can also package tours together, plan half-day or full-day experiences, make arrangements to meet local architects and municipalities, or help you gain access to significant buildings around Copenhagen. Get started by requesting a reservation. Who leads DAC architecture tours? Danish Architecture Center Guides are passionate and enthusiastic ambassadors who eagerly share their love of Copenhagen’s architecture and design. DAC Guides are multi-lingual (Danish, English, and often one other language) and typically masters’ level graduate students from local universities studying architecture, urban planning, landscape architecture, and other design fields. 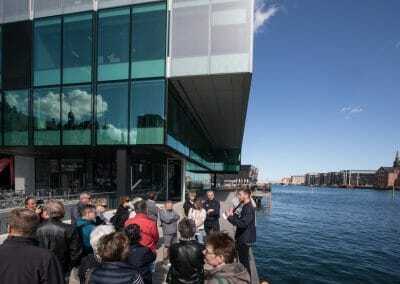 Throughout DAC’s Guide training program, they become experts in sharing the stories of Copenhagen’s architecture with visitors from Denmark and around the world. How do I get started in requesting a reservation for a group tour or lecture? Complete the reservation request form to share a few details about your group with us – which tours or lectures you are interested in, the size of your group, requested dates and times, and your contact information. We’ll follow up with you by email as soon as possible. During busy seasons, please expect a reply within 2-3 working days. Is admission to DAC exhibitions included in my group tour pricing? Yes! All private group tours – anywhere in the city – include entrance to DAC’s exhibitions on the day of your tour. Groups must come together and bring along a copy of the tour contract for admission. When can tours be arranged? Anytime you wish. Group tours can be arranged all year round, during the week or weekends, and during the day or evening. What is the maximum or minimum size for a group tour? We can create a group tour experience for any size group. Our special group rate allows you bring up to 20 people with one DAC Guide. Up to five additional people can be added to your group (priced per person) before another Guide is needed. We do this to ensure a personal experience on all tours. For more information email tourbooking@dac.dk. In what languages are group tours available? We offer all tours in both English and Danish. Several of our tours are also available in French. And if your group has your own interpreter, our Guides can work with them for simultaneous translation. For more information email tourbooking@dac.dk. What is the price for a group tour? More than 25 people per group requires an additional DAC Guide. How far ahead do I need to make a group tour reservation? We need at least 3 weeks in advance to ensure the specific tour, date, and time of your choice. Can I adjust the size of my group after booking our group tour? Our special group rate allows you bring up to 20 people with one DAC Guide. If the total number of people remains under 20, there’s no need to let us know of the change. If your group size increases above 20, five additional people can be added to your group (priced per person) before an additional Guide will be needed. At that point, we’ll simply issue you a new contract. Note: We need at least 14 days’ notice for increases to your group size which will require an additional Guide. We require full payment 14 days prior to all group tours and lectures. Cancellations made at least 14 days before walking or bike tour or lecture will receive a full refund. Boat tour cancellations require a minimum of 30 day cancellation for a full refund. Cancellations less than 14 days from any tour or lecture date will be invoiced for 50% of the contract. Do you give discounts on group tours? Yes! Discounts are available for any university, high school, or educational program. Tour operator discounts are also available. For more information email tourbooking@dac.dk. Can I use my DAC member card (Årskort) or Copenhagen Card to receive discounts on private Group Tours? DAC member card discounts are only available for public tours. You are welcome to use your membership discount to purchase tickets for your friends and family on all public tours. Can you create a customized, hosted tour experience? Yes! We can create a customized tour for almost any Copenhagen neighborhood such as: Nordhavn, Nørrebro, Christianshavn, or Carlsberg. We can also package tours together and plan half day or full day experiences around city with multiple modes of transportation. Our expert tour planners and hosts can connect your group with local architects, municipalities, and other non-profit organizations so you can learn about their work – or gain special access to many architecturally significant buildings in the area. For more information about custom tours complete the tour reservation request form or email tourbooking@dac.dk. Does DAC offer lectures and presentations for visiting delegations? Yes! 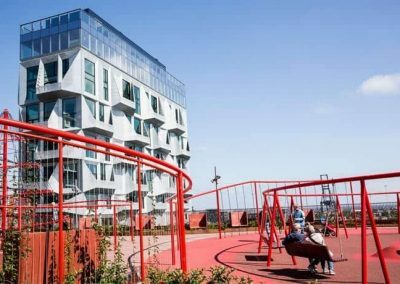 Learn more about Denmark’s national architectural policy, the history of contemporary architecture in Denmark, urban planning strategies, sustainable green initiatives, or why Copenhagen is often ranked as one of the most livable cities. Our expert DAC staff can give your group a deeper understanding and provide a 60-minute lecture on 5 different topics. Email Jen Masengarb jma@dac.dk for details. How do I get our group tour tickets? No tickets are required for group tours, but please bring your group contract with you on the day of the tour to check in your group. Your DAC Guide will meet the group at DAC or the tour’s pre-arranged starting point. Your contract also serves as entrance to DAC’s exhibitions on the day of your tour. Walking tours are 60 minute, 90 minute, or 2 hours. Bicycle tours are 2.5 hours. Private groups on boat tours are typically 60 minutes. Where can our group eat before or after our tour? DAC’s Café serves breakfast, brunch, lunch, and dinner – from coffee, snacks, and sandwiches to delicious Scandinavian meals – all with one of the most beautiful terrace views of the city. All group tours include entrance to DAC and the DAC Café. Accessible from outside the building, Meyer’s BLOX Eats café also provides sandwiches, hot lunch meals, and coffee. Can we get lunch or host our group’s meeting as part of a tour package? DAC’s full service Café and conference spaces can provide your group with breakfast, lunch, or coffee/snacks. Our stylish modern spaces – a large hall and small conference rooms – provide stunning views of the city and harbor provide the perfect location for your next meeting. Contact cafe@dac.dk for individual table reservations. Contact meeting@dac.dk for details and prices on conference room rentals for your group. 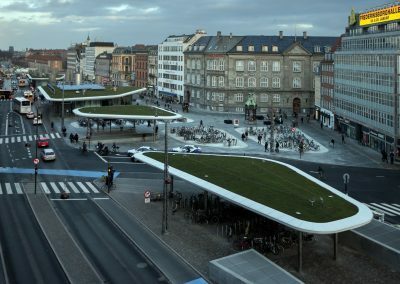 Is the Metro or bus transportation included for tours out to Copenhagen neighborhoods? Does DAC provide boats, bicycles, or busses for group tours? Where do we meet our DAC guide? The Danish Architecture Center is located in BLOX at Bryghuspladsen 10. Most of our group tours depart from DAC’s Welcome desk and large city map. Enter the building by walking down the stairs to Level -2 from the plaza. (Northwest side of the building, opposite the harbor.) For some neighborhood tours or customized tours, you’ll meet your DAC Guide at the pre-arranged location. All this detailed information will be included on your order confirmation. How do we get to the Danish Architecture Center in BLOX? Enter BLOX on Level -2 (down the stairs) from the large public square (Bryghuspladsen) on the northwest side of the building or the from the Harbor boardwalk on the southeast side of the building. Plenty of bike parking is available in Bryghuspladsen, the public square. From the bus stop it’s a short 5-minute walk southeast, along Frederiksholm Kanal to DAC. We’re located next to the Royal Library (Black Diamond). 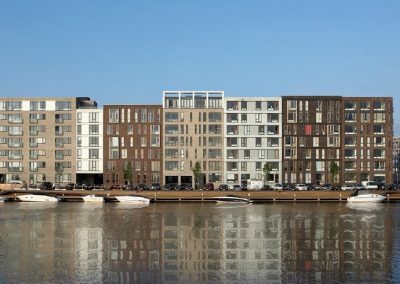 From the bus stop, walk over the canal bridge to Byrghuspladsen or enter DAC along the Harbor side of the building by taking the stairs down to Level -2. How close is DAC to key tourist landmarks? Danish Architecture Center is conveniently located within a 10-minute walk from the Danish Parliament, Tivoli Gardens, Copenhagen City Hall and Strøget (historic pedestrian street). Nyhavn (rows of colored houses) is a quick 20-minute walk. Where is the easiest place for our bus drop off our group at DAC? Your tour bus can unload at the end of Vester Voldgade, just northwest of the intersection with Christians Brygge. We suggest arriving and meeting your DAC Guide at least 10 minutes before the scheduled tour departure. 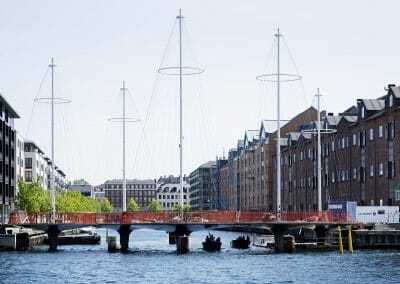 Where does our Harbor Tour by Boat dock along Copenhagen’s harbor? For more information, email our Tour Booking department. tourbooking@dac.dk. Or give us a call Monday – Friday between 10:00am – 12:00pm (GMT +1) at +45 2096 9342.